The Hermes is a serial data multiplexer which connects up to eight individual sensors (with RS232 or RS485/422 links) onto a single twisted pair. It can also be connected to fibre optic multiplexers if required. The system comprises of single PCB's at the surface and subsea end, either supplied as bare boards or housed in an enclosure at the surface end or pressure resistant housings at the subsea end. The complete system can be configured through a simple PC application running at the surface end 9configuring the subsea end remotely) and can connect both Sonavision and third party systems which require serial data transfer. 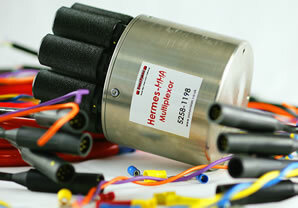 Provides the installation instructions for the Hermes data multiplexer unit. Use this software to configure the Hermes hardware units. This allows both top and bottom end to be configured from the top end using a PC and USB connection.